In Depression in Sylvia Plath's The Bell Jar, which forms part of the Greenhaven Press' Social Issues in Literature series and edited was by Dedria Bryfonski, readers will find a mixture of excerpts of previously published "viewpoints" on Plath's lone published novel. The book begins with a brief Introduction and Chronology before launching into the recycled content broken into three chapters: Background on Sylvia Plath, The Bell Jar and Depression, and Contemporary Perspectives on Depression. 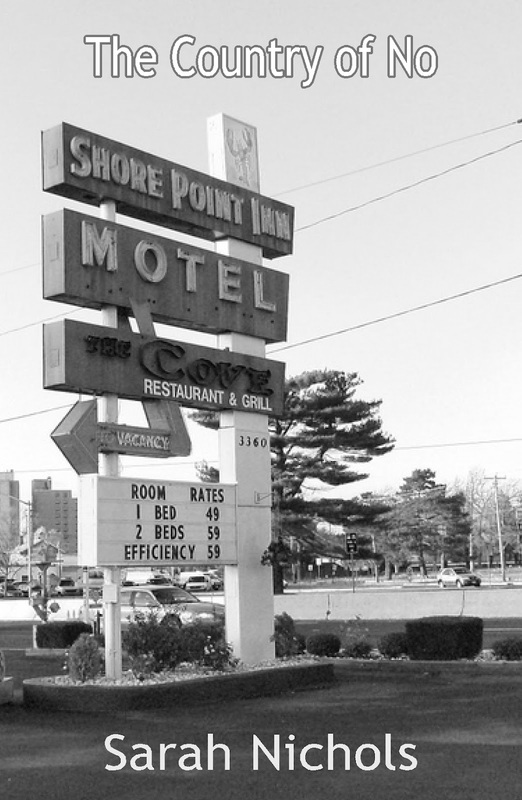 Chapter 1 includes "The Life of Sylvia Plath" by Timothy Materer, "Sylvia Plath Was the Personification of American Literature" by Ted Hughes, as told to Drue Heinz, "Sylvia Plath Was a Shining Intellect and a Superb Student" by Dorothea Krook, and "Sylvia Plath's Depression Was Inherited" by Jane Feinmann. I should say that these chapter titles are not the original titles under which the excerpts were printed, but merely summaries. In Chapter 2 we find "Sylvia Plath’s Retelling of Her Mental Breakdown Lacks Power and Emotion" by Saul Maloff, "Plath Uses Literary Doubles to Depict the Anguish of Her Schizophrenia" by Gordon Lameyer, "Illness Pervades The Bell Jar" by Howard Moss, "The Ending of The Bell Jar Is Cautiously Optimistic" by Caroline King Barnard, "The Bell Jar Examines the Public and Private Worlds of Madness" by Mason Harris, "The Bell Jar Relates a Girl's Search for Identity" by Marjorie G. Perloff, "The Bell Jar Chronicles a Search for Authenticity" by Susan Coyle, "The Bell Jar Illustrates Women's Limited Options" by Mary Allen, and "The Bell Jar Is the Story of Sylvia Plath's Mental Breakdown" by Linda Wagner-Martin. In Chapter 3, there is "Both Depression and a Risk Factor for Suicide Run in Families" by Paul Fink, "Perfectionism in Gifted Teenagers Can Be Deadly" by Laurie Hyatt, "Unrealistic Pressures and a Lack of Societal Safeguards Cause Depression in Teenage Girls" by Maxine Frith, and "Hard Questions to Ask After a Cry for Help" by Perri Klass. The book rounds out with a For Further Discussion series of questions, a section called For Further Reading, a Bibliography, and an Index. Enough with the summary. This book is another instance of an educational/academic publisher making a mistake. The only benefit to this book is that it saves researchers the trouble of looking for each of the pieces individually. However, by reprinting excerpts only, said readers/researchers are at a disadvantage by not seeing all the contextual information from the entire article. And, to boot, there are inconsistencies and errors and little niggling deficiencies galore. Firstly, there is inconsistency in how quotes are presented. Some are in double-quotes (") and some in single quotes ('). Secondly each quote does not have a citation page number reference: so how are students - the target market - supposed to find the quote in the original source? Thirdly, not all the books and sources quoted are listed in the bibliography (for example, Letters Home is quoted in Materer's piece and her Journals are quoted in the Feinemann one, but neither work appears in either the "For Further Reading" section or in the "Bibliography"). Bizarrely, Plath's Ariel and The Collected Poems are listed in the "For Further Reading" and not in the "Bibliography." And as regards the "For Further Reading" and the "Bibliography", I could not figure out the rhyme or reason to having them separated. Oh, maybe if I actually read the one book I could have, but I gave up. Relatedly, the "Bibliography" stinks and the authors are listed unconventionally in alphabetical order: not in "last name, first name" order; but in "first name last name" order. Still related to the Bibliography, for the sources listed that appeared in periodicals: there are no page numbers listed in the citation. I wish I was done, but I'm not! At the bottom of the first page of each "essay" is a citation. For a couple (Krook, Lameyer), the citation is wrong. Listed as appearing in Edward Butscher's biography Sylvia Plath: Method and Madness (1976), these two essays in fact appeared in his edited book of essays Sylvia Plath: The Woman and the Work (1977). As I have read all the original, full pieces, I can say that they are all interesting and representative of perspectives on The Bell Jar. So, good job on the selection (though admittedly I did not touch chapter 3 "Contemporary Perspectives" and prefer to ignore its existence). Lastly, while the binding of the paperback edition is good, and the cover is nice and glossy, the printing quality of the text is poor. Awful, in fact. The ink is faint in places and the quality of the photographs reprinted is also wanting. Overall I'm glad I didn't pay for it. Like I said in my review of How to Write About Sylvia Plath , academic publishers have a responsibility to publish good books for their [impressionable] student audience. 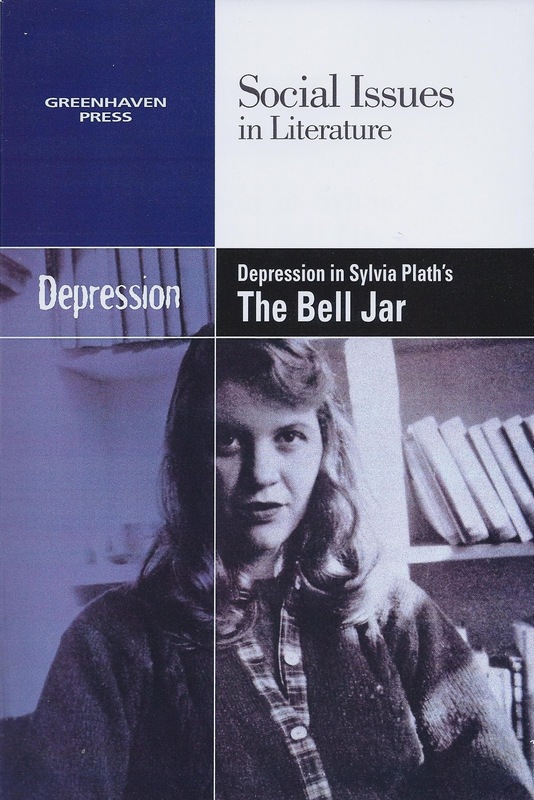 In Depression in Sylvia Plath's The Bell Jar, Gale/Cengage Learning and the Greenhaven Press fail miserably to uphold the burden of their educational obligation. This just felt wrong to do, but could not be avoided. Reading Sylvia Plath's The Bell Jar in front of North Belknap House, McLean Hospital. Following up to the update post from 11 July 2012 regarding the Sylvia Plath 2012 Symposium, just thought you might want to know that some of the panels have been expanded or modified in some way based on subsequent abstract submissions and the general craziness of organizing such an event. More updates will be made as they are known and necessary. Thanks for reading! In February 1962, the London Magazine printed Sylvia Plath's poem "In Plaster," which she composed on March 18, 1961 - the same day as "Tulips." 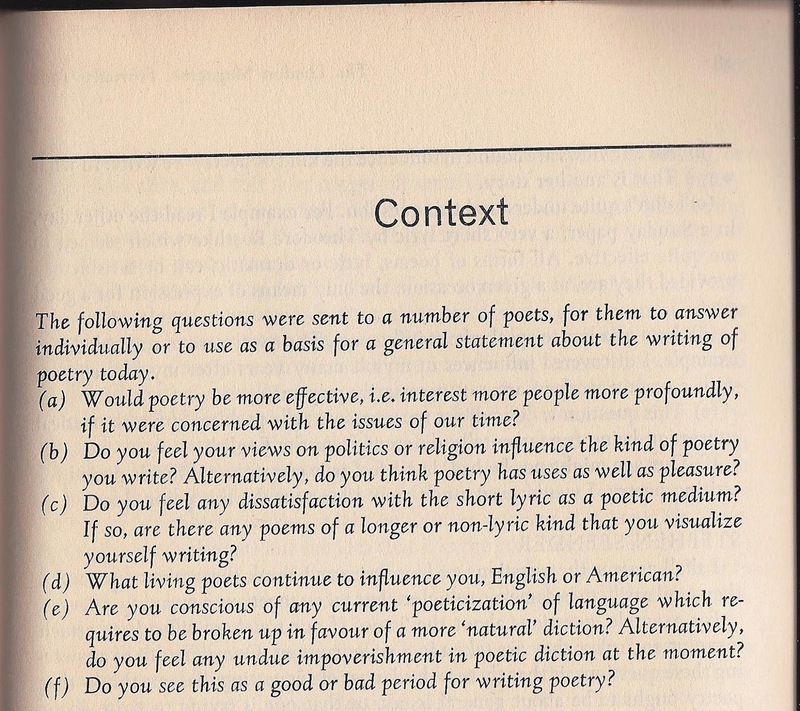 In addition to the poem, London Magazine printed twenty-six writers responses to a series of questions under the collective title "Context." We know Plath's response memorably begins, "The issues of our time which preoccupy me at the moment are the incalculable genetic effects of fallout and a documentary article on the terrifying, mad, omnipotent marriage of big business and the military in America-"Juggernaut, The Warfare State," by Fred J. Cook in a recent Nation." 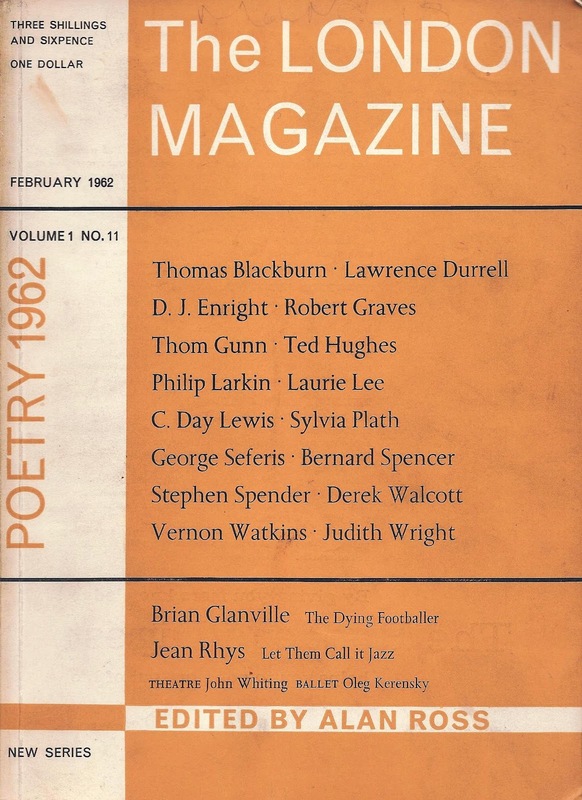 The twenty-six responses were submitted by (in order of appearance in the issue): Robert Graves, George Seferis, Stephen Spender, C. Day Lewis, Philip Larkin, Lawrence Durrell, Roy Fuller, Robert Conquest, Laurie Lee, Thomas Blackburn, Derek Walcott, Judith Wright, D. J. Enright, Thom Gunn, Charles Causley, Bernard Spencer, Vernon Watkins, Ted Hughes, Sylvia Plath, Edwin Brock, Hugo Williams, John Fuller, Julian Mitchell, Elizabeth Jennings, Anthony Thwaite, and Norman Nicholson. Thirteen of the poets had their photographs printed: Plath and Hughes did not. Hughes' own "Context," reprinted in Winter Pollen: Occasional Prose, begins: "The poet's only hope is to be infinitely sensitive to what his gift is, and this in itself seems to be another gift that few poets possess." Eighteen of those twenty-six contributors had poems in the issue as well. Perhaps the one readers might be most interested other than Plath's is Hughes' poem "Still Life." The eight writers that did not have a poem were: Robert Graves, George Seferis, Stephen Spender, Lawrence Durrell, Laurie Lee, John Fuller, Robert Conquest and Norman Nicholson. 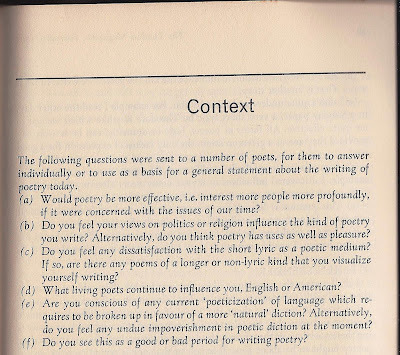 Of course the best way to put Plath's "Context" in context is to read "Context" in context of the journal issue. Many of this blog's readers might be interested in an update on the Sylvia Plath 2012 Symposium to be held in October at Indiana University at Bloomington, Indiana. Well, you will be satisfied by this post I hope. Please note that abstracts to present a paper on a panel are still being accepted and will be considered through September, or until spaces are all filled. If you do not yet have your full abstract, but plan to attend, please send the topic heading asap to Kathleen Connors at plath70ATindianaDOTedu. Lynda K. Bundtzen on Plath's 1958 poems and the unconscious, the Bee Sequence poems, and "A Self to Recover" exhibition works of Linda Adele Goodine, Boris Lurie, Kristina Zimbakova, Stella Vine. Amanda Golden on Plath in Devon, Modernism and "Lady Lazarus"
Langdon Hammer on literary biography; James Merrill's use of the Ouija in poetry; Plath's German, "Daddy"
David Trinidad on poetic process; use of the Plath archives in poetry; Plath's biographical references in October Poems. Single poems: "The Thin People"; "A Birthday Present"; "Daddy"; "Lady Lazarus"; "Ariel"
Are you presenting? Are you coming to just attend? What do you think of the program thus far? More details will be posted as they become available. I plan on live blogging from the Symposium, as well as live tweeting. So if you cannot make it, I hope to be able give you a sense of what it is like for the events and panels that I attend; and I hope to possibly coordinate blog updates with fellow attendees in events and panels that I opt not to attend. An official Symposium website will be up in the near future. Plath Profiles 3 contributor Sarah Nichols is publishing her first poetry collection, The Country of No, with Finishing Line Press. What can one say other than Congrats! In Plath Profiles 3, readers were treated with two poems: "An Air Crackling With Blue Light" and "The Moon is Not My Mother ". The former cleverly uses lines from Plath's works; and the latter - a poem for Sylvia Plath - is included in Nichols book, The Country of No. Like what you've read? Need more? Bill Buckley, founding editor of Plath Profiles, says: "Her voice is clear as a bell, compared to our current abstract and floppy American poetry. Emily Dickinson comes to mind, and Sylvia Plath. Yet, Sarah Nichols has her own, powerful voice." Buy the book, which is reasonably priced at $12.00! Shipping in the US is $1.99; international higher. Sarah recently started a blog for her book. Visit that page now! The following is a guest blog post by Julia Gordon-Bramer, whom you all know for her work on Sylvia Plath, Qabalah, and the tarot. If you do not know her work, visit Plath Profiles' website and see the last few issues: it is worth your while. At the 2012 Lawrence Durrell Centenary in London, England, I gave a presentation at Goodenough College on one of Sylvia Plath's most inscrutable poems, "A Secret," and how it corresponds with Durrell's most famous work, The Alexandria Quartet. Through these twelve stanzas of "A Secret," I demonstrate how Plath tours through the highlights (and low-lights) of these four stories--through infidelities, changing wives, blindness, smallpox, dead babies in drawers, and all. Special emphasis is placed upon the first Durrell book of the Quartet, Justine. Author Lawrence Durrell was a critically-acclaimed poet, artist, and novelist during and after Plath’s time. The first books of The Alexandria Quartet had come out in the late 1950s, and Sylvia Plath, Ted Hughes, and Lawrence Durrell had all shared the same London publisher, Faber and Faber. The three also appeared together in a February 1962 edition of The London Magazine. Additionally, Durrell edited a 1963 edition of New Poems 1963: A PEN Anthology of Contemporary Poetry that included both Plath ("Candles") and Hughes' ("Her Husband" p. 66 and "Wodwo" p. 67. ) work. As some of you may know, I have spent the last five years reinterpreting the work of Plath as its meanings come clear through tarot and the Qabalah. I affirm that each of Plath’s forty Ariel poems have at least six clear and different meanings within the same set of words, addressing Tarot and Qabalah, Alchemy, Mythology, History and the World, Astrology and Astronomy, and Humanities and the Arts. In addition, I contend that Plath was intentionally mirroring the six-sided Qabalah Tree of Life. I claim that viewing the poems through the lens of a mystical framework, Plath’s work has been mostly misread for fifty years, and that her real genius is only just beginning to be recognized. This PowerPoint presentation gives a high-level overview of the first five facets of "A Secret," and how they relate to and support the sixth facet of the poem---Plath's Humanities and the Arts tribute to Durrell's The Alexandria Quartet. Julia Gordon-Bramer is at work on two Plath-related books: The Magician’s Girl, a biography of the alchemical marriage between Sylvia Plath and Ted Hughes; and Fixed Stars Govern a Life: Sylvia Plath’s Qabalah Code. Julia Gordon-Bramer’s memoir, Night Times, will be published in 2015 by Walrus Publishing. An award-winning poet and short story writer herself, Gordon-Bramer teaches Humanities and Creative Writing at Lindenwood University, St. Louis. Cover, Table of Contents, etc. The Parallax Between Daughters and Fathers by Susan E. Schwartz, Ph.D.